According to a research report published today, Blacks and Latinos are “severely underrepresented” among borrowers who obtained a loan from a major bank to purchase a home in the city of Oakland. The report, by the Greenlining Institute and Urban Strategies Council, also found that banks issued a much smaller total number of home mortgage loans in Oakland compared to Fresno and Long Beach, two other cities analyzed in the study. And Black and Latino borrowers in Oakland applied for home loans at very low rates, and were approved at lower rates than whites. This dearth in mortgage lending by major banks in Oakland, compounded by low numbers of mortgage loan applications from Black and Latino customers, and lower loan approval rates, is perpetuating and exacerbating wealth disparities, the authors of the study concluded. The study analyzed bank lending data for the year 2013 that was obtained from the federal government. The twelve largest banks, measured by the total dollar amount of loans originated in California, were included in the study. The authors compared Oakland, Fresno, and Long Beach because these cities are of similar size and have racially diverse populations, and they represent different geographic areas of the state with different economies. The data analyzed by the Greenlining Institute and Urban Strategies Council showed that major banks are making far fewer total mortgage loans in Oakland compared to Fresno and Long Beach. “Despite comparable populations, Oakland had less than one quarter as many loan applications and originations as Long Beach and Fresno,” the report states. It’s unclear why major banks are approving fewer home loans in Oakland, but it may be due to Oakland’s increasingly unaffordable prices, and the presence of cash investors who crowd out buyers who need bank loans to close a deal. Whatever the cause, this lower level of bank lending in Oakland is compounded by racial disparities. According to the report, Black and Latino residents make up 56 percent of Oakland’s total population, but they received just 10 percent of the total dollars lent by major banks for home purchases. “Across the board, what the report shows is that Black and Latino communities were way under-represented when it comes to obtaining mortgage loans,” said Zachary Murray of the Greenlining Institute, one of the authors of the report. Greenlining Institute and Urban Strategies Council found that in 2013 the top twelve banks only approved a total of four loans for Black borrowers to purchase homes in the city of Oakland. The other 44 home mortgage loans made to Black borrowers in Oakland were refinance loans. In the same year, Latinos only obtained sixty mortgage loans in Oakland, and just seven of these were to purchase a home. By contrast, white borrowers obtained 358 mortgage loans in 2013 and 40 of these were to purchase homes. Asians obtained 186 mortgage loans, and 37 of these were to buy a home. Particular banks exhibited wide racial disparities in their mortgage lending activities. 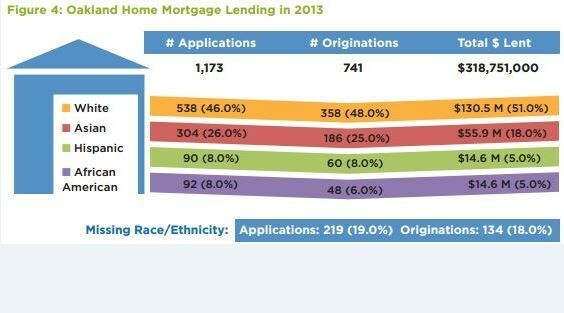 According to the report, Wells Fargo Bank, US Bank, and CashCall all exhibited much lower loan origination rates for Blacks and Latinos than for Asians and whites. A loan origination rate measures what percent of applicants for a loan are approved and receive the loan. Some banks, including Chase and Bank of America did better, originating loans at almost equal rates for Black and Latino customers as they did for white and Asian customers. But for all of the twelve banks analyzed in the report, white and Asian customers were more likely to have their loans approved than Black and Latino customers. Sasha Werblin of Greenlining, one of the authors of the study, said that lower average household wealth and income could be one reason that Blacks and Latinos are less able to obtain home loans. The economic crisis and recession of 2007-2010, and the foreclosure crisis that peaked in 2011-2012 reduced the savings of many families, and had a disproportionately harmful impact on Black and Latino households in California. But Werblin said that it is also incumbent on banks to offer sustainable and quality financial products that help them build wealth and secure housing. “What are banks doing to market to these individuals? Do they have products that would fit the needs of these individuals?” said Weblin in a previous interview.